Well, this year's Champions League of Darts tournament was certainly an unpredictable one wasn't it? 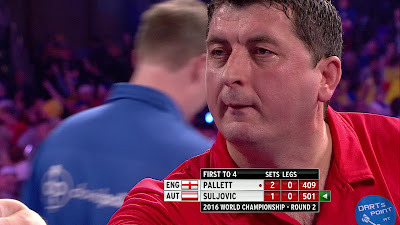 I was way off with this one, and it seems so were most others considering Mensur Suljovic was getting on for 50-1 with some bookmakers to lift the trophy (and generous odds even to get out of his group). He did have a degree of good fortune with the opponents he faced, and his three dart average in the final was far from impressive at 87.85 (but he hit his doubles! ), but he thoroughly deserved the win. It was touching to see what it meant to him and the struggles he'd faced in getting to where he is now. An entertaining two days by all accounts. The BBC must have been pleased with it!